Hubs and I have started a coffee shop tour! It’s easy to get stuck in a routine, or stay home because pajamas, but it really does feel good to get dressed for a coffee shop date and some strolling. Also, it’s nice to go somewhere together when it doesn’t involve errands or getting something done. We get to sit and talk with each other without distractions or responsibilities (even though some of the conversation might be what needs to get done when we get home. Ha!). Explore along with us! We ventured to Hal’s, a new kid on the block. Sit by the window on a sunny morning and take fancy pictures, people watch, dragon watch (yes, we saw a dragon pass by – it was Lunar New Year weekend), dog watch. The workers get excited when you order mochas “for here” because they get to practice their coffee art skills. Check out this beauty. 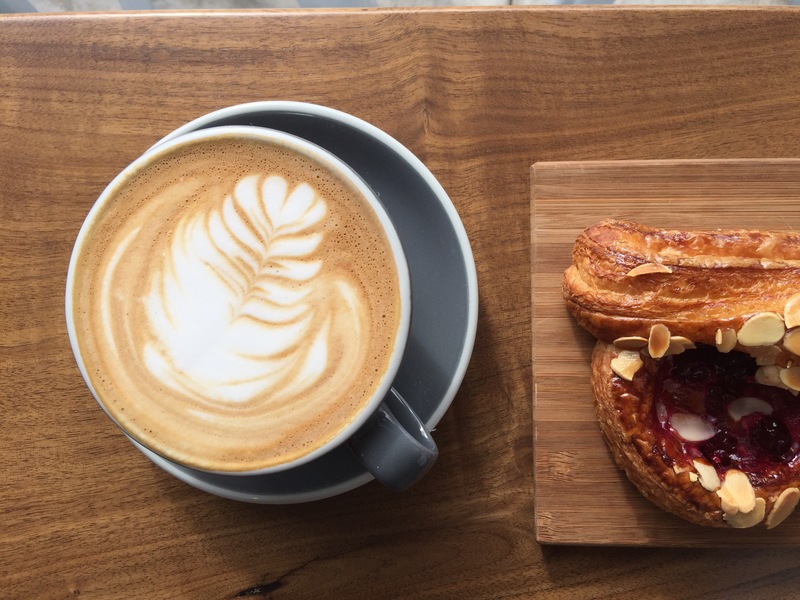 We tried the cherry pastry and the sausage & cream cheese croissant, both by Firebrand. And to drink: a mocha and an iced masala chai with almond milk. There’s seating for a dozen or so patrons inside and another dozen outside, lots of young families coming in on their morning strolls, and a local, small town feel. It’s also next to my favorite froyo place in the East Bay. Bonus: wood bar stools and table tops for the win. We stopped in on an early Saturday afternoon for a snack and caffeine session. 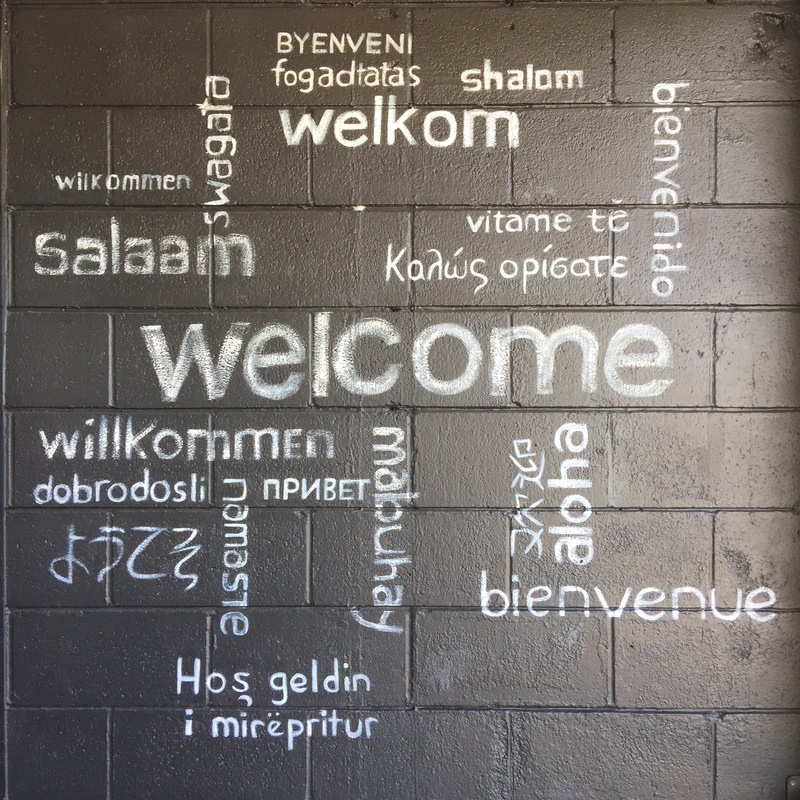 We were greeted by the Welcome wall. 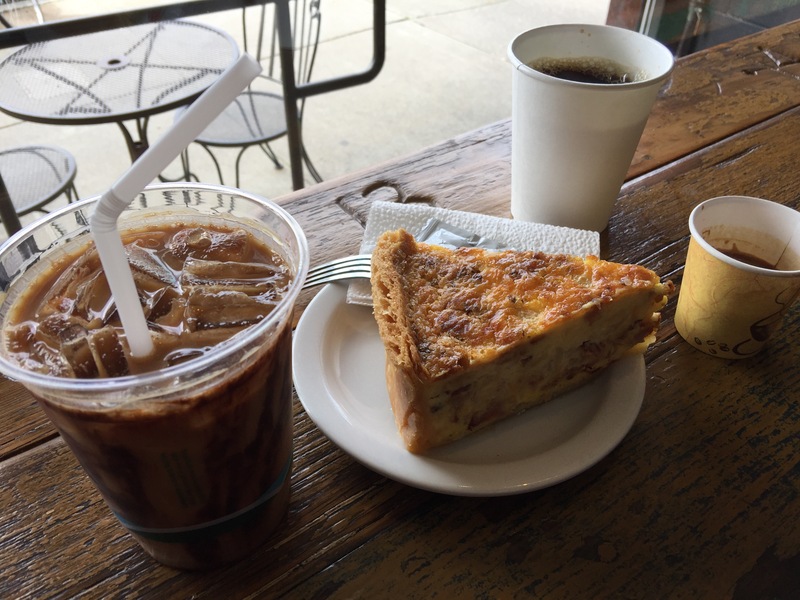 We tried the quiche, Mexi-mocha with almond milk, drip coffee, and espresso. We don’t hang out too much in this neck of the woods, but this shop is definitely a draw. 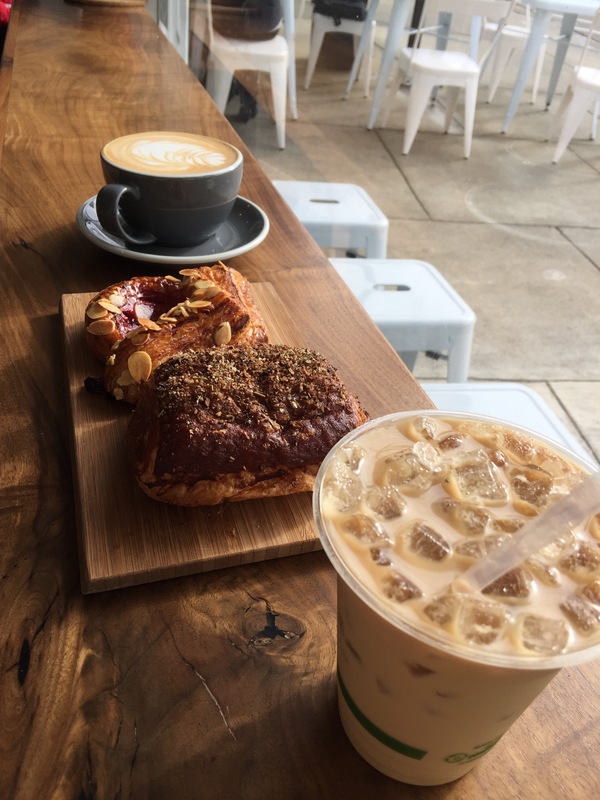 There’s a nice comfy vibe happening in this coffee shop – lots of regulars coming in and being greeted by the staff, and upbeat music that makes the customers dance. No really, people be dancing in the shop. After a morning of adulting, we ventured to States Coffee & Mercantile. While we waited for our order, we explored the wall of quality handmade goods. Talk about inspiration for our future home. 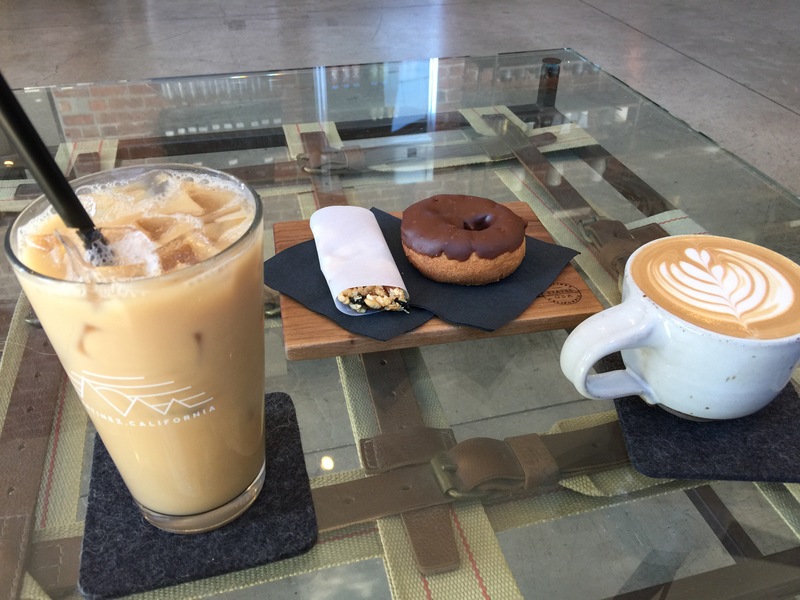 We tried the iced masala chai with almond milk, mocha, fruit bar (free with Yelp check-in), and chocolate donut. We also went home with a bar of local chocolate and inspiration to make our own fruit/granola bars. 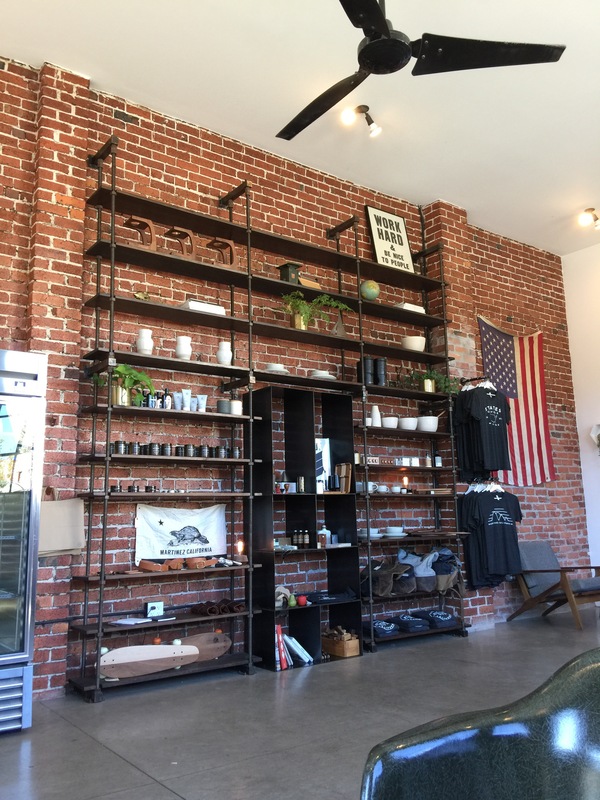 This coffee shop is a definite gem; I look forward to stopping in again. I love all the the branded glasses and serving plates, the ceramic mugs, the brick walls, the furniture. Until our next coffee shop date/adventure! Next Postan ode to nissan.